Welcome and thanks so much for stopping in today! I’m not sure what’s come over me lately but I’ve been in a purging, cleaning and organizing mood, much to the mister’s dismay, hitting nearly every room in the house. This past weekend was the basement’s turn so I descended into the depths of the dungeon and spent time cleaning up and organizing the leftover paint from our kitchen renovation. Usually, when I buy paint to use in a room or on a piece of furniture, I’ll leave it in the can. I always use a spout, and it does work well for a while, but it inevitably gets messy with dried paint around the rim causing both the can and lid to rust. Not good when you have half a gallon of good paint left. So, to keep paint longer I started using glass and plastic food containers bound for the recycle bin. My container of choice lately has been orange juice containers because they are tall and slim, so you can store more in a small space, and see-through, so you can see what you have and how much is left. The oj containers I used have a small opening so we used a water bottle with an even smaller opening as a funnel. We just cut off the bottom and turned it upside down in the oj bottle. So easy and completely free since you’re using something that would be tossed out anyway. I also filled up a small creamer container that will be stored under my kitchen sink, for quick touch ups. 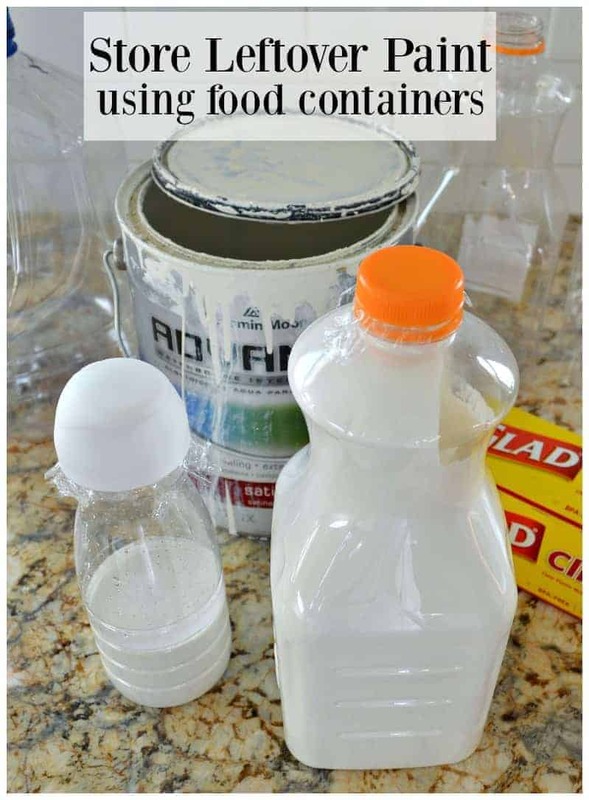 I know that keeping paint in recycled bottles or jars may not be a new and clever idea, but I do have 1 tiny, little tip to share. I place a small piece of plastic wrap over the opening before I put the lid on. It helps keep air out and it also keeps the lid clean and dry so you won’t have a crusty, dried mess that prevents you from closing it tight. The only thing missing was a label. I just use painter’s tape and, along with the brand, color, formula (in case you need more of that color) and finish, I add the month and year it was stored. I know, I know…so easy…but if you spend $20 or $30 on a can a paint, you want it to last as long as possible right? 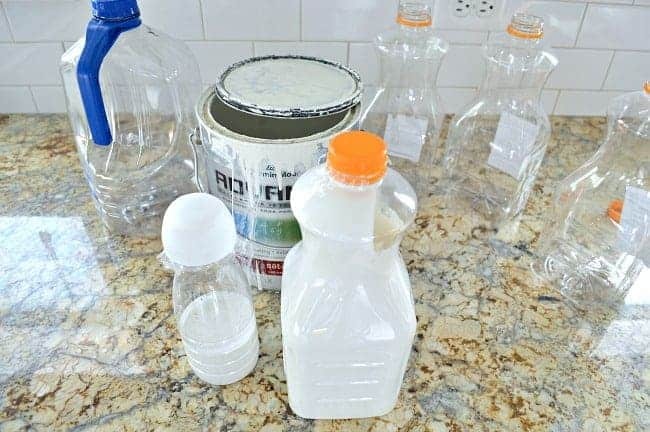 Now you can go and pull all of those plastic bottles and glass jars out of your recycle bin and use them to store leftover paint. Any tips you care to share for storing leftover paint? Looking for more organizational and storage ideas? 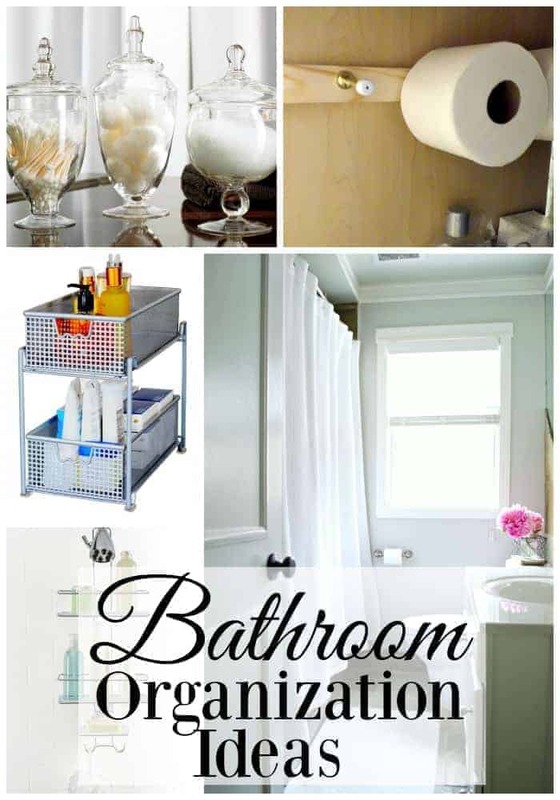 Check out how I tame the clutter in my small bathroom. Hi Lyn. 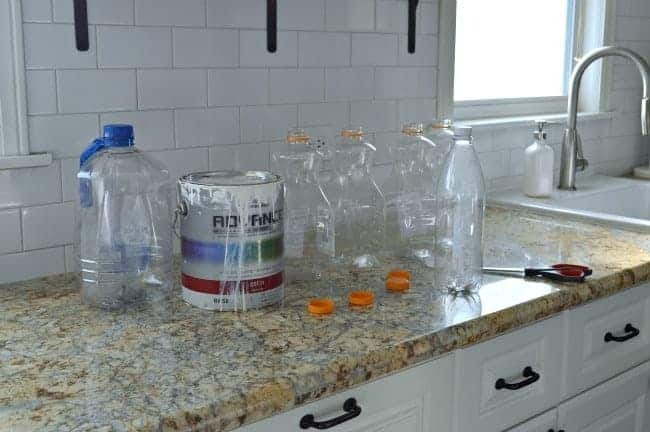 We have cans like that right now and I would suggest you go to Lowe’s or Home Depot and look for a gallon plastic container with a lid (they usually sell them by the paint supplies). 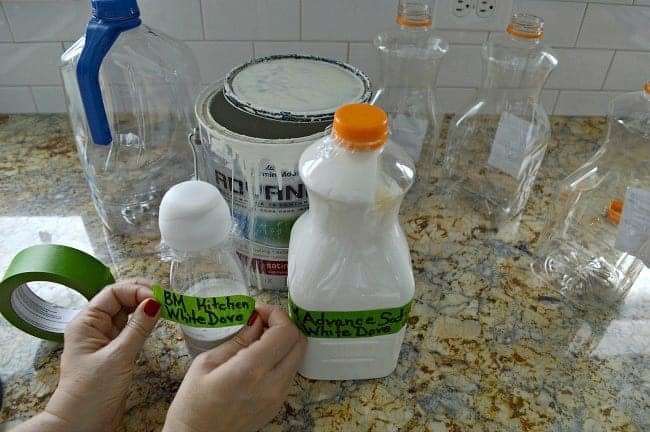 Transfer the paint into the plastic container and you are good to go. Hope that helps. Thanks for your post.I also use those to store paint.I use them as well in and around the gardens to hold water for those plants that just need a drink,but not all do ,and you don’t want to have to drag the hose just for 1 or 2 plants..The glass jars,like those spaghetti sauce comes in are good for pouring that bacon grease into,then when the jar is full,just toss the whole thing.They have lots of uses,so i always keep a couple on hand,the rest i put in the recycling bin..
Great ideas, Kathi. Thanks for sharing. Oh, we’ve gone with the paint dripped cans look too. 😉 We’re getting quite the paint collection and running out of storage space so this definitely helps. Hope you have a great week! 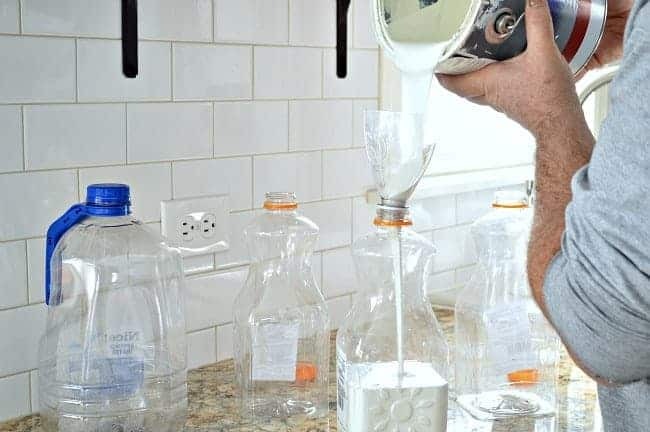 That’s a neat idea, and seeing the color is awesome too as well as pouring it out! Thank you! Thank you! I like to be able to see the color, and if I’m getting low on supply, so this works great. Hi Nancy. 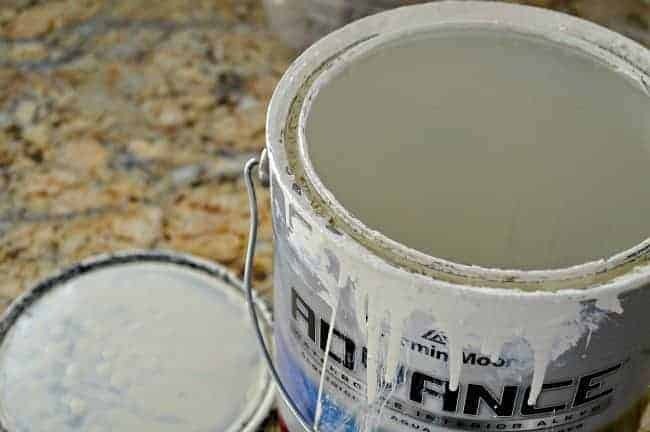 To mix the paint, I just shake it really well (and I’ve never had a problem). The containers are fairly small so it’s not a lot of paint to mix. Thanks for stopping in my friend! Happy weekend! Will the plastic withstand the paint such as enamel paints? 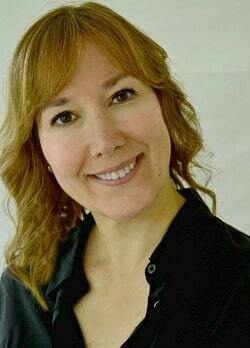 Hi Brenda, thanks for your question. I would say that glass would probably be better to store enamel paints. Hope that helps. my good friend does this. just dont ever knock them over before you cap them lol! Great point Jan. You can never bee too careful when there are children in the house. Thanks for sharing. 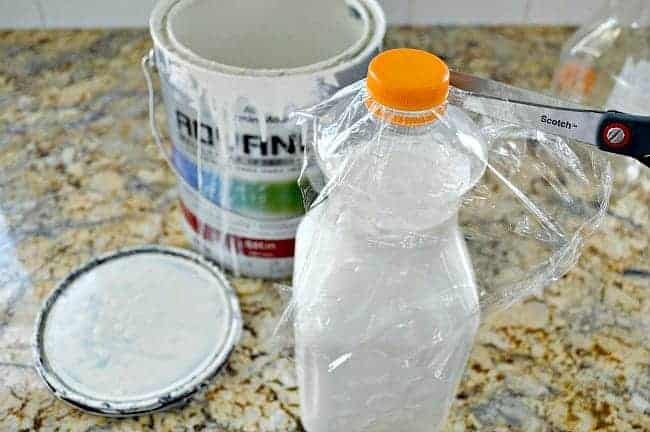 Great tips for storing paint and it will look so much nicer in your storage area. Thanks for sharing. Thank you Patty. It does make the storage area look nicer and my dark and dusty basement can use all the help it can get. 😉 Have a great week! Thanks Debbie! What color are you going to paint your front door? your paint storing idea is excellent. My not being a handy man, in the least, I tend to waste too many materials, mainly by improper cleaning (paintbrushes, rollers, roller pans, etc.) This paint storage idea is right up my alley. I keep these plastic containers for starting vegetable seeds in for my garden, so I have several. The prior owners of this house, left several paint cans, high on a shelf in the wash house. The temperature is 25 degrees right now here, an hour East of Dallas,TX, but when Summer rolls around, I’ll sort those paint cans and see exactly what I have. Thank you for the idea. Thanks so much Charley. I’m glad you found my tips helpful. Brrr, 25 degrees in Texas seems pretty cold, although we were at around 10 yesterday. LOL Thanks for stopping in and have a great week!